The driving force behind one of Britain's most celebrated writers, Charles Dickens, is explained in a document illustrating the hardship he suffered in childhood. An entry from the Marshalsea Prison day book is to go on display at a National Archives exhibition next week. It marks the day Dickens' father was admitted for massing debts. 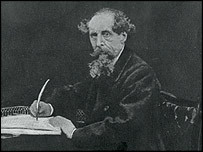 Charles Dickens (1812-1870) wrote 25 books, many of which were serialised in magazines and which were characterised by attacks on social evils, injustice, and hypocrisy. The Victorian is one of 17 great Britons featured in the "Movers and Shakers" exhibition at the National Archives in Kew, west London. His childhood helped to nourish his fertile imagination and his father's imprisonment had a profound effect on him. It meant the young Dickens was forced to leave school at the age of 12 to work in a factory. The document says John Dickens was "committed for incurring debts to the sum of £40 and 10 shillings". National Archives curator Sue Laurence says: "That document encompassed the kind of pain, from trying to survive on his own feet, which informed many novels. "He works through this whole issue in his work - the infantile and feckless adult who is improvident and the child beyond their years having to take on responsibility at a young age." This painful experience re-surfaces in many episodes of the novels. In Little Dorrit he writes powerfully of the destructive effects of prison on family life. "The shadow of the Marshalsea was a real darkening influence and could be seen on the Dorrit family at any stage of the Sun's course", he wrote. One theme that recurs is the child being exposed to adversity at an excessively early age, including Oliver Twist, David Copperfield and Nicholas Nickleby. Dickens briefly resumed school when his father's circumstances improved. He then went on to become a junior law clerk, followed by an independent reporter for the law courts and then a journalist. A second document that features in the exhibition is a broadsheet written by Robert Huish entitled "the Progress of Crime or the Authentic Memoirs of Marie Manning of Minver Place, Bermondsey". This popular broadsheet was distributed at the hanging of Marie and Frederick Manning in 1849. Marie was the inspiration for Hortense, the sinister French ladies' maid in Bleak House. Marie's depiction in the broadsheet matches Dickens' description in the novel where he paints her as dressing neatly with a veil and gloves and having: "a certain feline mouth and general tightness of the face". Movers and Shakers is at the National Archives in Kew, west London, from 6 December - 31 May.